So, lets take a look at how you can add content to your Tribes while scheduling and from the Pin Inspector. 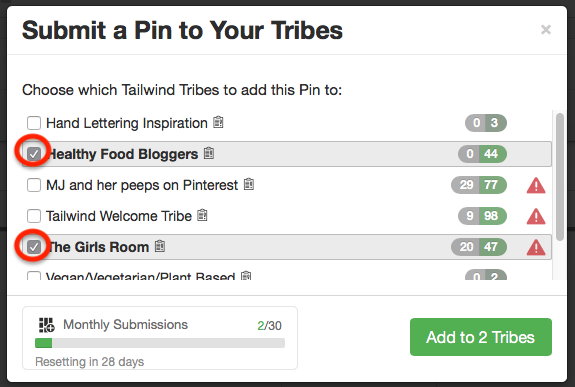 Add any Draft Pin to Tribes while using the Tailwind Browser Extension or while scheduling right from your Drafts page. After choosing a Pin from Pinterest or from a website, click on the "Add to Tribes" button. 2. In the pop-up box, select which Tribe(s) you'd like the Pins to be sent to. To save you time, you can send the Pins to more than one Tribe if you'd like! 3. These Pins can be found in the All and Yours tabs for you and others to share! Helpful Tip: After scheduling Pins to Tribes from Pinterest or a website, a Draft is automatically created and can be viewed in the Drafts section of your dashboard. This makes it easier for you to place your favorite content in your Tribes as well as in your personal queue! Go to the "Pin Inspector" page (located in the pop-out menu in the left hand navigation). 2. 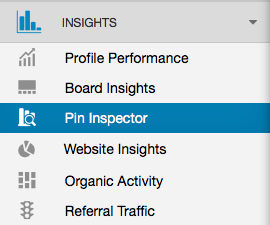 Use the Pin Inspector to find the best performing Pins and click the "Add to Tribes" button. 3. In the pop-up box, select which Tribe(s) you'd like the Pins to be sent to. To save you time, you can send the Pins to more than one Tribe if you'd like! 4. These Pins can be found in the All and Yours tabs for you and others to share!